Ever had an issue with all the different file formats? “Can you send it over in another format suitable for print?”, “The image resolution is too low.”, “Do you have this available as an EPS?” Or some other acronym of seemingly random letters! No doubt you’ve heard these questions being asked at some point, and as a design agency, we’re probably one of the main culprits – we’re sorry! 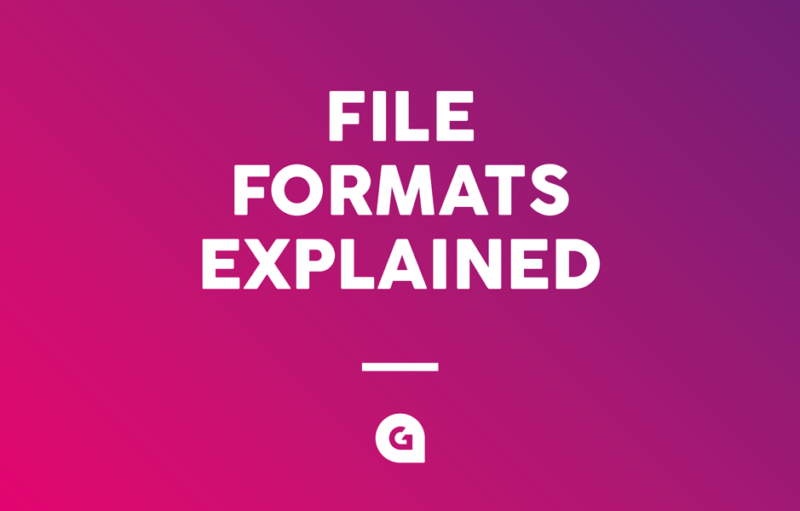 As an apology, we wanted to create a handy guide to help you understand all the different file formats, including what, where, and how they should be used. Hallelujah! JPG and JPEG are interchangeable. They both have the same meaning. The different file extensions are due to the earlier versions of Windows. JPGs are one of the most popular image file formats and compress an image, significantly reducing the size of the file. For example, digital cameras or smart phones use this as a primary file format. The JPG is considered ‘lossy’ – which means that when the data is compressed, unnecessary information is deleted from the file permanently, making it ideal for sharing and storing. High resolution (300dpi) JPGs can be used for print and low resolution (72dpi) JPGs, while not print-friendly, are a good choice for web. Their low file sizes are ideal for optimising website loading times. A GIF is a lossless format for image files that supports both animated and static images. Creating reduced file formats without degrading the visual quality, GIFs are widely used online. Due to the colour limitations, the GIF format makes it unsuitable for reproducing complex colour photographs but it is well suited to simpler images with solid areas of colour. PNGs were developed as an improved alternative for the GIF format to combat the colour limitations. Like the GIF, PNGs use a lossless compression, allowing for easy storage, sharing and are ideal for use on the web. PNGs are low in resolution and not suitable for print (unless you know a lovely design agency who will convert to another format for you). TIFFs are the most widely supported format across all platforms. Typically large files, they are used to store original images or artwork without any quality loss. PDFs (Portable document format) were created to improve the ease of sharing documents and are compatible across multiple platforms, software and operating systems. A document is converted to a PDF when it does not need to be modified and can be printed, emailed, linked to and downloaded with ease. That’s what we like to hear! 99.99% of the time, Glow’s final artwork files are sent to print as PDFs. PSDs are PhotoShop files, a format developed by Adobe. Often used in design, these are created when editing or manipulating photographs, graphics, or digital and website design. You can find out what else PhotoShop is used for here. Often large in size, these can contain multiple layers and remain editable for future adaptations. EPS files can contain vectors (a digital image created using paths and shapes which are not made up of a grid of pixels so can be scaled to any size without hindering quality), images, and text. Often used in the creation of logos or large-scale artwork, EPS files are supported by many editing software applications. AI stands for Adobe Illustrator and, like a PSD, is a file format developed by, you guessed it… Adobe. Used to create vector-based designs, AI files are artwork files used to create EPS and PDF files. An INDD or an IMDL (an older file version) is a file type used by Adobe InDesign. InDesign is used in the creation of page layouts and can contain images, objects, and text styling. Can be used for designing newspapers, books, brochures, and other professional layouts. We’ve only touched on some of the most common file formats, but if you’re enthralled, a full list is available here. If the images are for print, use .EPS (Vector), .PDF (Vector) or .TIFF (300dpi). If you want to keep a version that remains editable, choose your software’s native file format.